2012 seems to be drawing to a close on a strange note of instability and unpredictability rather than the cast iron certainty that Putin’s return to the presidency in May seemed to promise. Recurring questions about Vladimir Putin’s health, an unfolding anti-corruption campaign that seems to tell ordinary Russians more about their ordinary rulers than those very rulers wanted them to know, Prime Minister Medvedev’s statement that he does not rule out running for the presidency again…2012 seems to be drawing to a close on a strange note of instability and unpredictability rather than the cast iron certainty that Putin’s return to the presidency in May seemed to promise. A few Moscow-based Kremlin-gazers are even entertaining the suggestion that Putin may be considering an early exit, Boris Yeltsin style, handing over power to a prime minister of his choice who will become the next head of state. The question of the president’s health went from being just one more piece of gossip on the Moscow rumour mill to full-fledged concern after the Japanese prime minister told journalists that this was the reason he cancelled a visit to Russia. He was brusquely ‘corrected’ by the president’s press secretary Dmitry Peskov, a rare occurrence, to say the least. 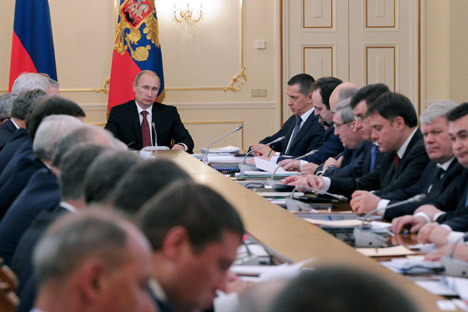 Peskov said no firm date had been set for the meeting. This would seem to stretch credibility. I remember very well how Putin’s predecessor, Boris Yeltsin, had a heart bypass operation in November 1996. At that time his entourage had to decide whether to hide the truth (or at least to play down the issue), or switch to a full-throttle media coverage of the president’s illness. For a while, they employed the traditional approach of covering up the president’s weakness. But then they opted for the other path – to a resounding success. Yeltsin, who had scraped to re-election in June and July that same year, battling single-digit approval ratings, suddenly received an inflow of support from ordinary people. They could sympathise with the otherwise distant old man in the Kremlin because anyone can get seriously ill, presidents being no exception. Yeltsin was generally bolder than Putin as far as public image was concerned. He was never afraid to admit weakness, an ultimate strength in a politician provided they know how to turn this into an advantage. Putin and his advisors continue to stress his fitness because it served the president quite well for a long time. But they never found themselves in a situation in which they had to deal with Putin’s health as an issue. It increasingly seems that they may have to look for a new approach. Issues of consistency and trust have, out of the blue, besieged the Kremlin. It is less of an issue in foreign relations, although the number of visits the president cancelled or moved is indeed unusual. There are diplomatic channels to convey things that are not for public consumption. It is not yet an issue of Putin’s public standing. State-controlled TV is very skilled at adjusting reality to demands of political expediency. But it is an issue for the ruling class. An apparent clash between what the media and now foreign politicians report and what the Kremlin says confuses those who form the bedrock of Putin’s support: senior bureaucracy, the management teams in state-owned corporations, the police and the security services, as well as the army’s top brass and the oligarchs. In a system that revolves around one man, his health is much more than just a private issue or a matter of public interest. This much is evident.